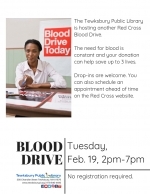 The Tewksbury Public Library is hosting a Red Cross Blood Drive. The need for blood is constant and your donation can help save up to 3 lives. Drop-ins are welcome. You can also schedule an appointment ahead of time on the Red Cross website.